I-Mockery has up a review of Halloween Candy for 2005. X-Entertainment reviews the Jones Soda Halloween flavors. And yay, the Halloween Countdown is well underway. Yay! The Meat Head pages have reappared! Meat Head is a fabulously elaborate and utterly disgusting way to serve cold cuts for Halloween. I mean, you could do it for other holidays but I don’t think anybody would find it funny on, say, Labor Day. For a completely different holiday – instructions on how to make sturday Christmas Crackers, with links to more at the bottom of the page. Last night I managed to roll and cut out the pastillage stars and bake around 100 cupcakes, here are 96 of them. Having the divided dry ingredients made things so much easier, yay me! How much do I love the cupcakes containers? Much. They’ll make transport far easier. The stars are stacked between layers of parchment and stored inside a mostly airtight container. Tonight I make a massive amounts of buttercream, decorate, and we’re off to the party. 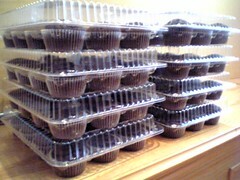 If I hadn’t managed to get these cupcake trays I would have used the large shallow rectangle Rubbermaid Take Alongs. They hold 12 cupcakes pretty well, and are deep enough for some taller frosting. Something I stumbled across while looking for cupcake transport – Ziploc makes huge storage bags, the boxes show pillows and sporting goods fitting inside. I’m guessing they’d work well for yarn and fabric storage for the fiber obsessed. Birthday Cupcake Baking update: Last night I divided dry ingredients into bags based on which ingredients will be going in at the same time. This will free up my measuring cups for the wet ingredients and I’ll spend a lot less time cleaning inbetween batches. Somehow every grocery store around managed to simultaneously run out of packs of regular white baking cups, which was ok since it gave me a reason to take some time to drive out to Home Cake and buy in larger bunches and get some backup pastry bags at the same time. I resisted impulses to buy more pastry tips and tiny heart sprinkles. (And tiny candy cup molds to make peanut butter cups to put in ice cream, the ice cream I’ll make myself with the ice cream maker I don’t have yet.) I took the pastillage out of the fridge to get ready to roll out. I’ll cut out the stars tonight and store them in an airtight container between layers of parchment paper. Have acquired expensive chocolate and vanilla beans, makes me happy. And I finally had a reason to buy one of those flats of 18 eggs. The latest Martha Stewart Kids (Fall 2005) has some great Halloween cupcakes, I love the tentacles. But my question is: where did they find the dark brown cupcake liners? I keep coming across this question, usually for someone looking for them to do wedding cupcakes — see this post at Cupcakes Take the Cake. The liners in question are dark brown glassine like the little candy cups in an assortment box, or the wrapper on Reeses cup. Apparently Sprinkles in LA uses them (another). I’ve become curious and done some poking around, The Baker’s Catalogue carries unbleached cupcake liners which are a little darker, and apparently Bon Appetit used Pannettone cups for a wedding cupcake spread. I have seen brown striped with gold cups like these at Home Cake here in Seattle. The Martha Stewart Kids doesn’t list sources. I’ve gone from mildly curious to mildly obsessed. Does anybody know if the general public can buy these anywhere? update: That was fast! Lisa found brown cupcake liners at Confectionery House. Thanks Lisa! I bought one of those rubber ice cube molds at Ikea the other week. It’s four oversize cubes. At first I just thought huge ice cubes would be funny but now I’m realizing you can freeze larger items inside of them, and Halloween is coming. For a few years Scott searched for a little wallet that would hold just a few cards, forcing him to avoid the Costanza wallet phenom. He found the perfect one made by Sugabeats – ta da, the card holder. He got black with a red star (do we see a pattern?). Scott uses it all the time and loves it, the clear pocket on the back is perfect for flashing your id on the way into a 21+ show. About a year later this one made by Coach appeared. Needless to say, the one from Sugabeats is a bit more affordable, but should Scott ever suddenly become, say, a lawyer, the Coach one might be more appropriate. via Uncrate, I think. A gazillion ways to tie your shoelaces at Ian’s Shoelace Site. via kottke. I also found the Lacing for a Better Fit stuff at New Balance helpful for my high arch lace pressure ouch thing. I heart Campari, and Accidental Hedonist has a post about the history of Campari. See also, my favorite cocktail (well, aperitif) the jasmine. While looking around for opinions on liquid bandages I found some helpful information on how to deal with split nails here on a forum for balloon twisters. My nails tend to split under the fleshy part (ouch!) and on occasion I have resorted to a combination of nail bandages (small clear oval stickers you can occasionally find in the manicure section of drug stores) with a fake nail glued over it. I think I’ll try a dot of superglue next time. Jelly Yarns. I can almost see the handknit fetish wear. Thanks to Anne for pointing me to it. Instructables, a site with lots of how-tos for, oh gosh, everything. Very impressed. Source is lost to me, but my thanks. Lifehacker tries out that boiling an omelette in a bag thing, and it works! FoodieView, a recipe search engine including food blogs. Oh yes, yes! Not surprisingly, I forgot where I first saw this but (say it with me), thanks. I have two new things in the stuff to make section – pictures of my tiny donut making experiment, and my funny hat in which I used tubular cast on (oooooh). Oh man Kepler’s is closed. I’m so sad, I have a few memories from that place even though we only lived there a year. Some ways to keep giving to hurricane relief even if you’ve already donated to the Red Cross — buy some music from CD Baby or buy some handcrafted goods at Etsy in a joint move with Craft Revolution.